Amniote Origins integrates modern systematic methods with studies of functional and physiological processes, and illustrates how studies of paleobiology can be illuminated by studies of neonatology. For this reason, comparative anatomists and physiologists, functional morphologists, zoologists, and paleontologists will all find this unique volume very useful. 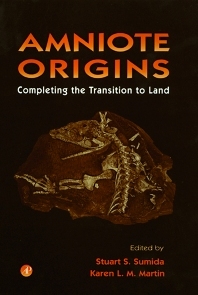 Inspired by the prospect of integrating fields that have long been isolated from one another, Amniote Origins provides a thorough and interdisciplinary synthesis of one of the classic transitions of evolutionary history. K.L.M. Martin and S.S. Sumida, An Integrated Approach to the Origin of Amniotes: Completing the Transition to Land. M. Laurin and R.R. Reisz, A New Perspective in Tetrapod Phylogeny. D.S. Berman, S.S. Sumida, and R.E. Lombard, Biogeography ofPrimitive Terrestrial Amniotes. J.B. Graham, N. Aguilar, R. Dudley, and C. Gans, The Late Paleozoic Atmosphere and the Ecological and Evolutionary Physiology of Tetrapods. G.V. Lauder and G.B. Gillis, Origin of the Amniote Feeding Mechanism: Experimental Analysis of Outgroup Clades. N. Hotton III, E.C. Olson, and R. Beerbower, The Amniote Transition and the Discovery of Herbivory. M.J. Packard and R.S. Seymour, Evolution of the Amniote Egg. J. Stewart, Morphology and Evolution of the Egg of Oviparous Amniotes. L. Frolich, The Role of the Skin in the Origin of Amniotes: Permeability Barrier, Protective Covering, and Mechanical Support. S.S. Sumida, Locomotor Features of Taxa Spanning the Origin of Amniotes. K.L.M. Martin and K.A. Nagy, Water Balance and the Physiology of the Amniote Transition. T. Garland, K.L.M. Martin, and R. Diaz-Uriarte, Reconstructing Ancestral Trait Values Using Squared Change Parsimony: Plasma Osmolarity at the Amniote Transition. Subject Index. California State University, San Bernardino, U.S.A.